Salon Crie is a full service natural hair salon that was created by natural hair expert and stylist Aminah Lawson. 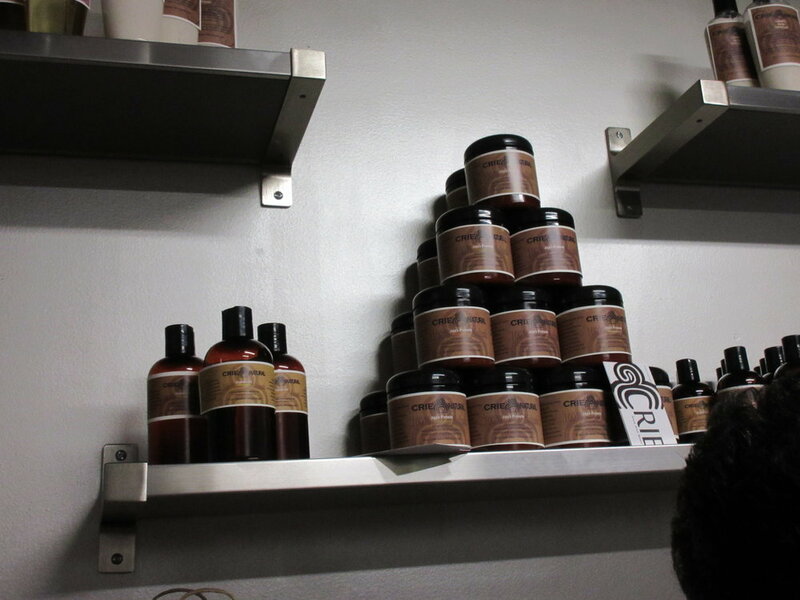 Lawson's line of natural hair and body products, Crie Natural, is also available at her salon, which is located on 351 Martin Luther King, Jr. Drive in Greensboro, NC. The launch party for this salon was equal parts glamor and Southern charm, complete with mini chicken and waffles, shrimp and grits, and almond tea from KimBee's. Models with hair styled beautifully by Lawson offered guests samples of Crie Natural products. I had a chance to sit down with Lawson to ask her about her motivation behind her business and her passion for natural hair. 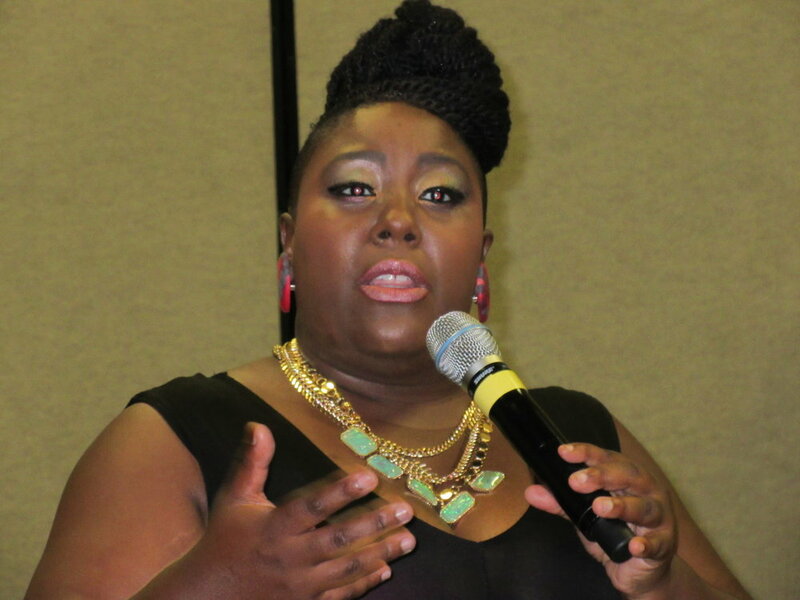 NN: When did you first develop a passion for natural hair and decide to pursue this profession? AL: I’ve always loved it and I have always been very strong in it. When I first got into the industry, I did everything, but about 8 years ago I decided to solely focus on it (natural hair care), but I’ve always offered natural hair services to my clients. It’s where I am strongest. NN: As far as your products are concerned, there has been a trend lately of companies creating natural product lines that seem to follow in the footsteps of Lisa Price's Carol's Daughter. What differentiates your products from some of the ones that are currently out? AL: Well, when I created my line, I really created it for the beauty professional that was looking for green products. So that was really the first thing…it was targeted toward the professional to use on their clients. And when I created my line, I created a system of products that can be used interchangeably. A lot of lines say “hair and body” and that typically means they have hair products and they have body products. So when I created Crie Natural I created products that could be used both on the body and on the hair. NN: What is your favorite product from your line? AL: I actually have two: Jaja’s Hair and Body Pomade which is our top selling product. Everyone who tries it loves it. That’s a really popular one. Also our Moist Hair Elixir, that’s our newest product. That’s been my favorite product because I use it a lot in my salon services. NN: For someone who is transitioning to natural hair, what is the main tip that you would tell them for how to achieve a healthy transition? AL: Get with a stylist that knows how to deal with transitioning hair so that you can do it safely with the least amount of breakage and that will maintain the best integrity for the client’s hair. This swanky event was organized by my SoRHOr Lady Bizness AKA Chisa Pennix-Brown. She's a master brand strategist, so check her out if your business branding needs a makeover! I've been wanting to go to this natural hair festival for over a year, and it was everything I dreamed it would be. One thing I looked forward to the most was the big bag of sample goodies that made me jealous of my co-workers who went to the event last year. My bag was filled with goodness from Coco Curls, Taliah Waajid, Eden Body Works, Bee Mine, and so much more. I loaded up on Eden Body Works Coconut Shea line, which is now my new wash and go system. I'll tell you how I'm liking it in a future post. Don't let the date fool you...it was still summery hot when I went to the Bookmarks Festival in Winston-Salem on September 6th. I have to be honest and say that there wasn't really much of interest for me at this year's festival, but I was able to pick up a clean eating cookbook by Matthews, NC native Lisa Leake entitled 100 Days of Real Food. I tend to judge a cookbook by how good the breakfast recipes look since that's my favorite meal, and Leake's Breakfast Sausage Casserole looks pretty promising. Look out for a review on this book along with my experience of recreating one of her meals. So that was my summer. I'm looking forward to an even better fall! What was your favorite event from the summer? Let me know in the comments!